The auditions for the much anticipated reality television show, commenced today, Friday, February 1, in Lagos, Abuja, Port Harcourt, Ibadan, Calabar, Warri and Enugu states, as revealed by the TV show. 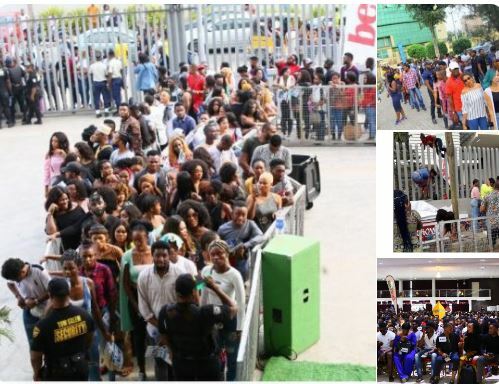 Reports on twitter have claimed that in some auditioning centres, as many as over 50,000 Nigerian youths turned up for the auditioning, leading to heavy traffic. Other reports claim a youth slumped at the venue because of suffocation from the crowed. But why the craze for BBNaija? The answer is not farfetched. Avoiding the temptation to delve into discussing the unemployment rate in the country, as well as the recent millions of job losses, however, the ongoing university strike action in the country is not a reason unconnected with the large crowed at the auditioning. More so, the revelation made In a recent interview, by the Chief Customer Officer of MultiChoice Nigeria, Martin Mabutho, says it all. He had revealed in the interview that the prize money for the 4th edition of the show will be above N45 million, which is way bigger than what previous winners went home with. And Nigerian youths can’t keep their eyes off that prize! Hence, the frenzy. In last year’s edition, tagged, Double Wahala, it was Nigeria’s flyboy, Miracle, who smiled home as the winner. This year’s winner is really going to be tougher in arriving at, owing to the large crowed that has made itself available for the show. Meanwhile, an assemblage of video and photo tweets from Nigerians provides a better understanding of the subject matter. “@realDreyPR: Can you imagine what’s going on at the #BBNaija audition today? Am bringing you Live updates on #BBNaija as it is happening..